Why do you need to learn Russian? Around 300 million people all over the world speak Russian, making it one of the main languages of international communication. What are the advantages of knowing the language? Russian still plays an important role in post-Soviet countries. It remains one of the official languages in some of those countries, the language legislations are publishing in. Some nations use it in international negotiations and it can be considered a 'second language' for the citizens of these countries. 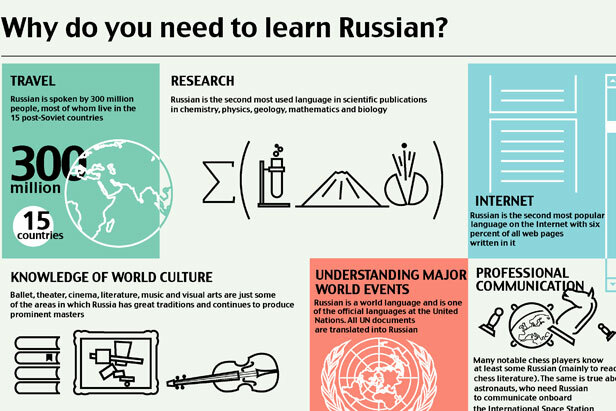 Speaking Russian not only allows you to meet new people all over the world while traveling or chatting on the internet, it also opens new opportunities for education, scientific research, and business communication in Russia and other countries.